Eventually, with the combined effect of pneumothorax fear and the introduction of the axillary approach in 1949, the supraclavicular block fell out of favor. In 1978, La Grange described the use of the Doppler probe to identify arteries, which helps to locate the brachial plexus. Kapral et al expanded that idea with the first described ultrasound imaging of the brachial plexus in the supraclavicular position and the needle insertion under ultrasound guidance. Vincent Chan then described the use of both ultrasound and nerve stimulation to perform the block. All upper extremity blocks involve the brachial plexus. The brachial plexus arise from the anterior rami of C5-8 and T1 with some contribution from C4 and T2. The rami unite to form superior, middle, and inferior trunks. They occupy the space between the anterior and middle scalene muscles. Each trunk divides into anterior and posterior divisions, which rejoin to form 3 cords: lateral, posterior, and medial. 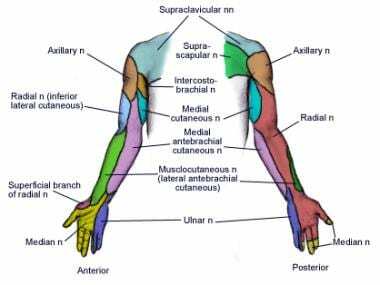 The medial brachial cutaneous and medial antebrachial cutaneous nerves come of the medial cord. The cords then pass into the axilla and divide into nerve branches: the musculocutaneous, axillary, radial, median, and ulnar nerves (see the image below). The brachial plexus can be blocked anywhere along its course, from the neck to the axilla. The supraclavicular block is used for surgeries or postoperative pain control for the upper extremities. It is best for areas below the mid-humerus level. Above the mid-humerus, the shoulder area, an interscalene block would provide better coverage. However, if enough volume is used it can diffuse to the shoulder area. The major advantage of the supraclavicular block is that the nerves are tightly packed in that area. This gives a very fast deep block, giving it the nickname "the spinal of the arm." Very few needle adjustments are needed once the subclavian artery and the dome of the lung is visualized. The goal is to get around the subclavian artery, where the nerves are located, and stay away from the dome of the lung, avoiding a pneumothorax. This approach has less chance of blocking the phrenic nerve than the interscalene approach. A disadvantage of the supraclavicular block is the proximity to the pleura, which causes concern for a pneumothorax. Contraindications include the patient not consenting, allergy to local anesthetics, infection at site of injection, or inability to insert needle or place probe at the needed area due to a splint, cast, or dressing. These are all absolute contraindications. Mani KV, Veerapandiyan A, Radhakrishnan S. A study on comparison between ultrasound guided technique and peripheral nerve stimulator guided technique in performing brachial plexus block (supraclavicular approach) for upper limb surgeries. International Journal of Medical and Health Records. July 2017. 3:61-64. Hannannavar KA,. Mudakanagoudar MS. Comparison between Ultrasound-Guided Supraclavicular Brachial Plexus Block in Upper Limb Surgeries. Anesth Essays Res. June 2017. 11:467-471. [Medline]. Abhinaya RJ,. Venkatraman R., Matheswaran P., Sivarajan G.,. A Randomised Comparative Evaluation of Supraclavicular and Infraclavicular Approaches to Brachial Plexus Block for Upper Limb Surgery using both Ultrasound and Nerve Simulation. Indian Journal of Anaesthesia. July 2017. 61:581-586. [Medline]. Correct head position, transducer position, and in-plane needle insertion. Reproduced with permission. White box is area scanned; SA=subclavian artery, SV=subclavian vein, SAM=scalenus anterior muscle, SMM=scalenus medius muscles, C=clavicle. Reproduced with permission. Arrows=needle placement in-plane; arrowheads=brachial plexus nerves; SA=subclavian artery. Reproduced with permission.